Lock in a great price for Saint George Hotel – rated 9.2 by recent guests! Having been Island-hopping for a week we were ready to stay in one place, and we could not have chosen better than the St. George. 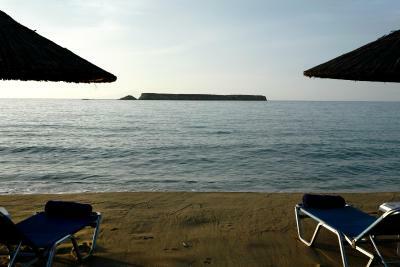 Our room, the staff, the location, the food, the beach, all were first-rate. We wished we had planned to stay longer and would certainly return there again. The hotel manager helped find us a very affordable rental car at short notice. Vangelis, our waiter, gave us a lesson on how to choose the freshest fish! The pool is lovely, the beautiful beach just steps away. 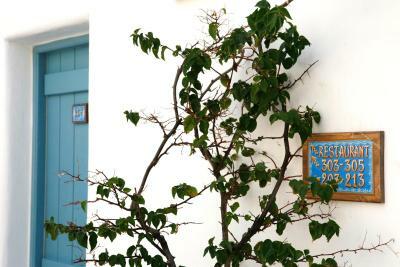 We were on our honeymoon, and made some great memories in Paros and at the St. George Hotel. Staff was excellent. Gorgeous hotel pool /bar/restaurant and views of the beach. Rooms are clean and spacious. All the staff was super kind and attentive, making sure you feel welcome. The food was really nice and the beach incredible. 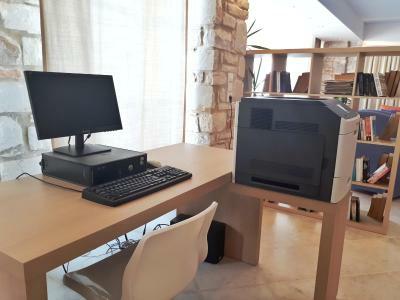 It is better to rent a car if you plan on visiting the rest of the island, but the front desk will help you find an agency that can even drop the car at the hotel. Super easy! Very good location. 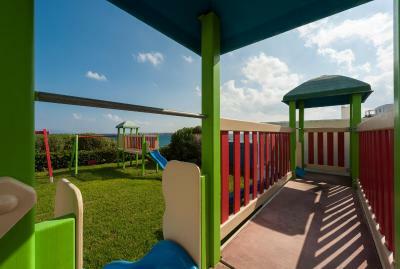 Good facilities (swimming pool, playground, bar/restaurant near the pool). Friendly staff. Property was good and we had an amazing view! Adrianna at the front desk was very helpful and very nice. The young lady Jessica who worked at the morning breakfast was very sweet and engaging. Property was right on the beach and fairly private. You definitely need to hire a car to get around the island. The pool is just beautiful, although the water was freezing and the winds were crazy (end of August) The view of the beach and the sea is really special Michaelis at Reception is terrific, warmly welcomed us upon arrival and was very helpful throughout our stay The adjacent Blue Dolphin taverna is a definite must! For the ambience, the cuisine, the backdrop, and the warm hospitality by the owner and his dedicated staff! Staff was extremely helpful and even helped us arrange a rental car at the last minute. 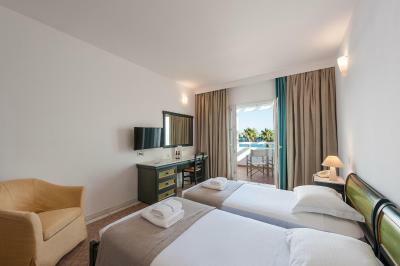 The room had a gorgeous ocean view and was well appointed and clean. 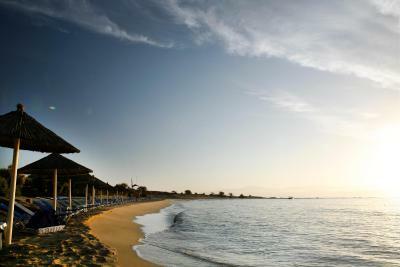 The hotel is well situated by a nice sandy beach. Access to the beach is easy. It has a good exercise room. Rooms are a good size. The view from the pool/breakfast area is beautiful. It's a quite location, family-friendly. Satisfactory breakfast buffet included. Beautiful facility, friendly staff, very relaxing. Pool was great, plenty of size to cool off and enjoy. 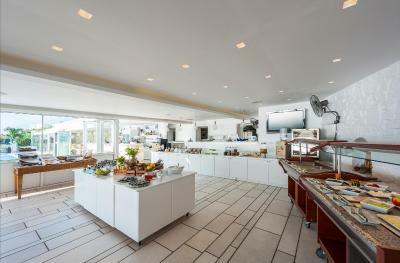 Saint George Hotel This rating is a reflection of how the property compares to the industry standard when it comes to price, facilities and services available. It's based on a self-evaluation by the property. Use this rating to help choose your stay! 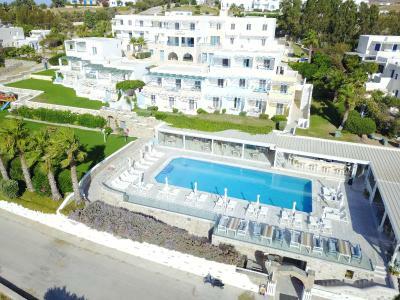 Quietly located in New Golden Beach of Paros, the beachfront, 4-star Saint George Hotel has a beautiful pool with a poolside bar, overlooking the Aegean Sea. 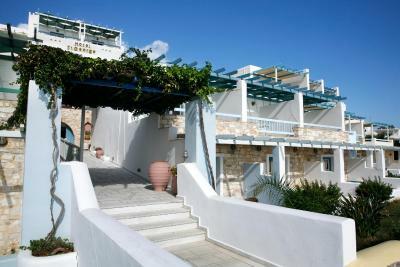 Its air-conditioned rooms offer a private balcony and free Wi-Fi access. 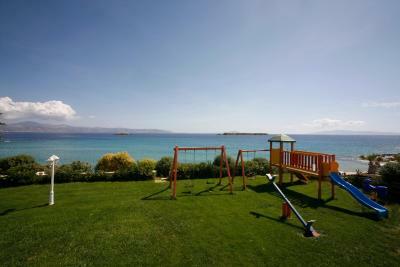 The famous Chryssi Akti Beach is 2,300 feet away. 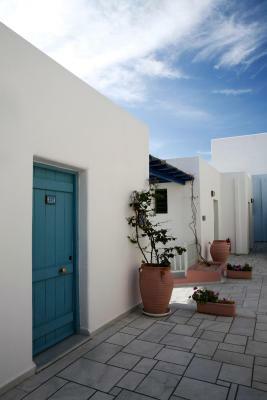 The rooms of Saint George are decorated in natural colors and include traditional Cycladic features. They are fitted with a satellite TV, laptop safe box and hairdryer. 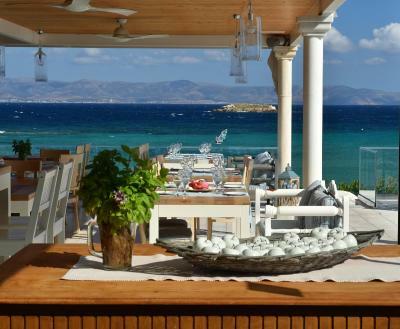 Most rooms enjoy views to the Aegean Sea. 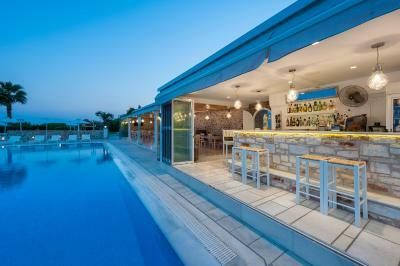 Guests can enjoy traditional dishes or fresh fish and local wine at the poolside restaurant offering magnificent views to the neighboring island of Makronisi. When would you like to stay at Saint George Hotel? 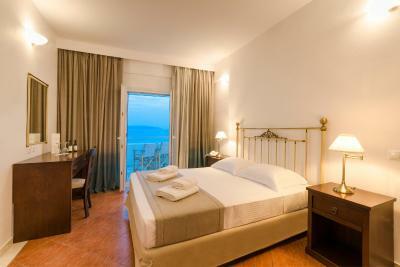 This room consists of a main bedroom and a living area and opens to a private balcony overlooking the Aegean Sea. 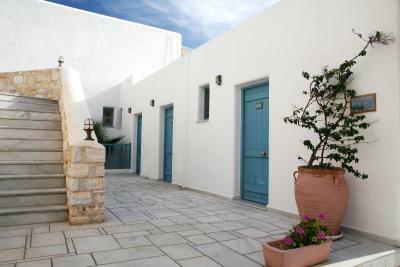 It is decorated in natural colors and includes traditional Cycladic features. It is fitted with a satellite TV, laptop safe box and hairdryer. Free Wi-Fi is provided. 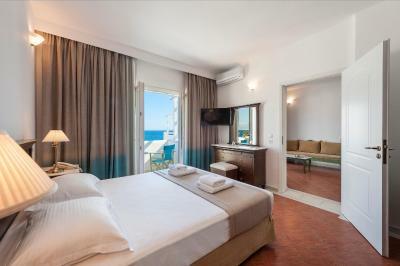 This spacious suite has 1 bedroom and a seating area and opens to a balcony overlooking the Aegean Sea. 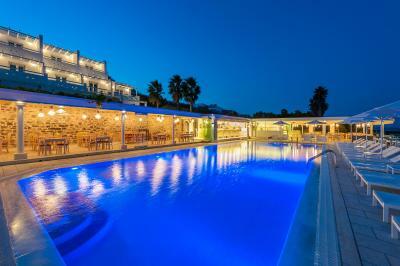 It is decorated in natural colors and includes traditional Cycladic features. It is fitted with a satellite TV, laptop safe box and hairdryer. Free Wi-Fi is provided. 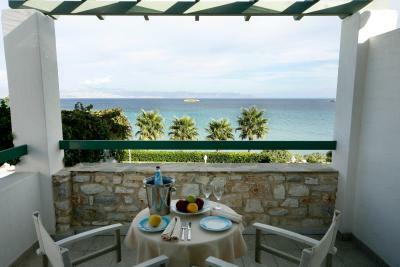 Featuring a spa bath, this spacious suite opens to a balcony overlooking the Aegean Sea. 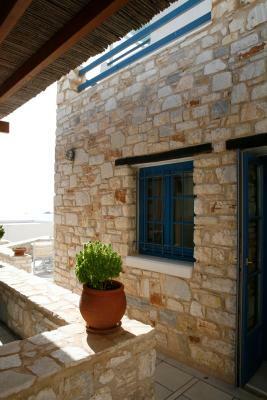 It is decorated in natural colors and includes traditional Cycladic features. It is fitted with a satellite TV, laptop safe box and hairdryer. Free Wi-Fi is provided. 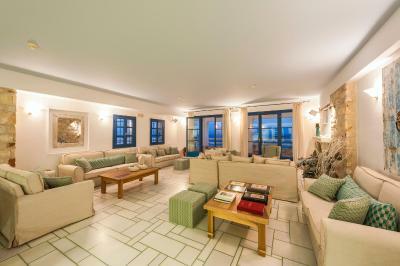 This suite consists of 2 bedrooms and a living area and opens to a private balcony overlooking the Aegean Sea. 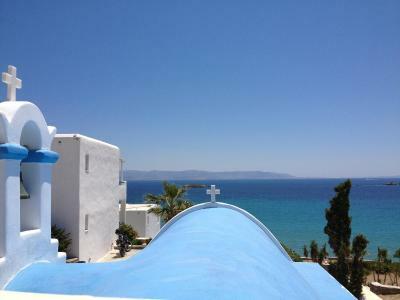 It is decorated in natural colors and includes traditional Cycladic features. It is fitted with a satellite TV, laptop safe box and hairdryer. Free Wi-Fi is provided. It can accommodate up to 4 people. This air-conditioned room offers a private balcony and free Wi-Fi. 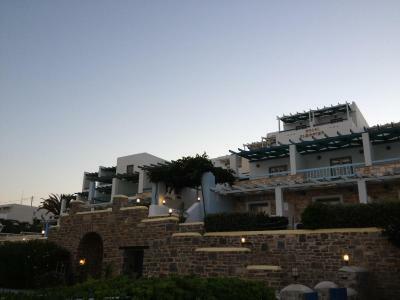 It is decorated in natural colors and includes traditional Cycladic features. It is fitted with a satellite TV, laptop safe box and hairdryer. This twin/double room has air conditioning, private entrance and patio. House Rules Saint George Hotel takes special requests – add in the next step! Saint George Hotel accepts these cards and reserves the right to temporarily hold an amount prior to arrival. To secure your reservation, 1 day's payment must be paid to the hotel via your credit card. 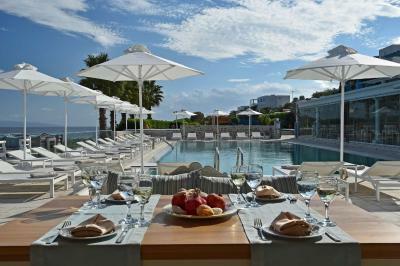 This hotel participates in the Greek Breakfast Initiative by the Hellenic Chamber of Hotels. Please inform Saint George Hotel of your expected arrival time in advance. You can use the Special Requests box when booking, or contact the property directly using the contact details in your confirmation. 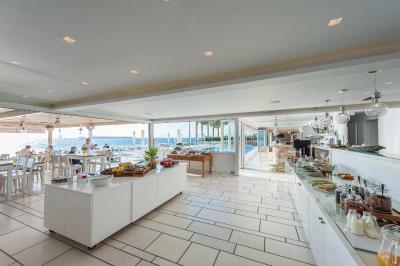 Friendly and helpful staff, directly on the beach, the restaurant was very good..the food was always excellent, lots of parking spaces and the room with sea view is very nice! The view is beautiful. We were staying there in october so it was a very quiet and relaxing stay. 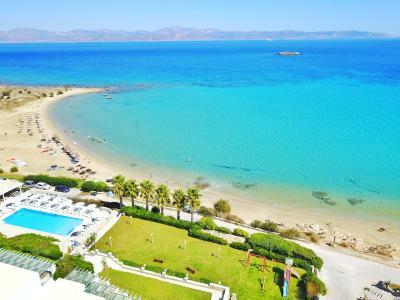 You can reach everything in Paros by car very easily and there is a lot of beaches near the hotel that you can reach by car. Lovely beach front hotel, friendly and helpful staff, excellent breakfast .great room. I would have liked to stay longer. Nothing other than the fact that the local tavernas weren’t open but that was because we visited late in the season. 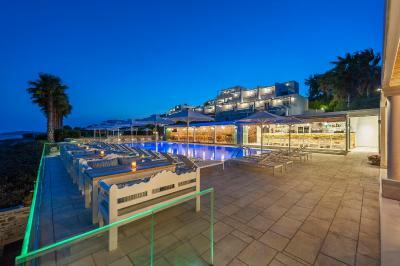 Beautiful beach, pool, views, bar, views and views! We were upgraded to a Seaview room and the views were simply stunning. Considering the rate, rooms are dated and would benefit from upgrades to match the rest of the hotel. 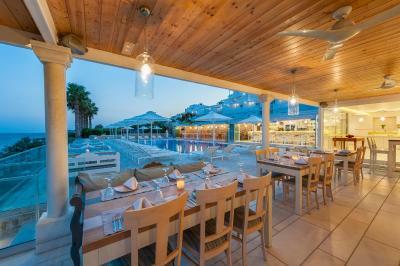 Great location with a very nice restaurant and swimming pool area. The beach in front is also amazing with crystal clear waters. Great views. Bed was a little hard for my taste. 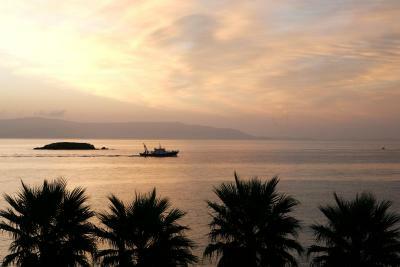 Everything was perfect, room, breakfast, staff, location with beautiful sea view. Thank you to all the team! 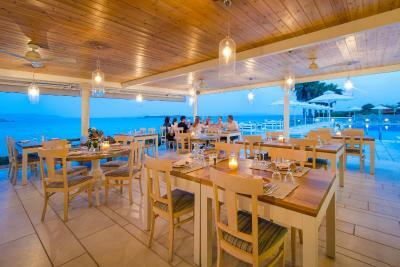 You can even order your cocktail or food when you stay at the beach which is really appreciated! We really recommend this place. We will come back for sure. Nothing much to do around, less for kids. Great place to stay, great stuff very helpfull. 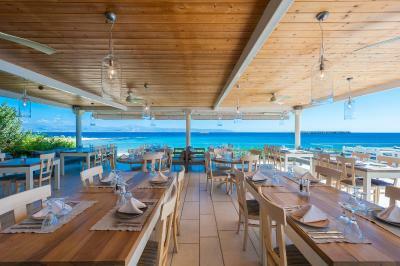 Easy Access to the beach; good restaurant! It was a large bedroom and a wider bed would have been good. The toilet in the big bathroom was facing the side of the shower, I am only five feet eight but I could not sit straight on the toilet. This affects me as I have a bad knee which will not bend well, It is simply poor design but it is too late now it is built. The bathroom was clean but not perfect. A piece of residue I the wall remained throughout our stay. I could have cleaned it but wanted to see if it was noticed. Excellent pool, very clean. All public areas and restsurantveryclean. Very good food. Good chef.I Good staff in the restaurant, pool area, and also Michael is in reception. Glorification adjacent to a wonderful sandy beach. Great views.